Tanna of the second generation. 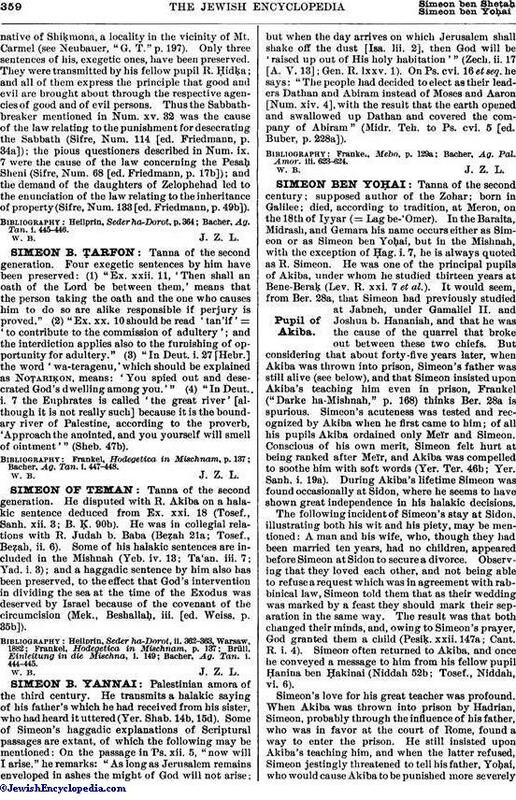 He disputed with R. Akiba on a halakic sentence deduced from Ex. xxi. 18 (Tosef., Sanh. xii. 3; B. Ḳ. 90b). He was in collegial relations with R. Judah b. Baba (Beẓah 21a; Tosef., Beẓah, ii. 6). Some of his halakic sentences are included in the Mishnah (Yeb. iv. 13; Ta'an. iii. 7; Yad. i. 3); and a haggadic sentence by him also has been preserved, to the effect that God's intervention in dividing the sea at the time of the Exodus was deserved by Israel because of the covenant of the circumcision (Mek., Beshallaḥ, iii. [ed. Weiss, p. 35b]). Bacher, Ag. Tan. i. 444-445.